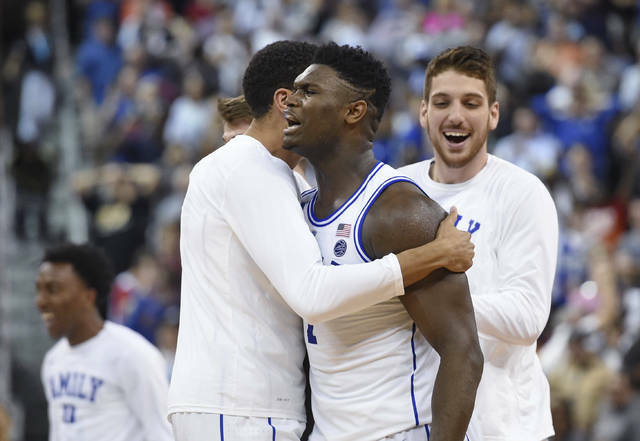 RALEIGH, N.C. (AP) — The path to the Final Four will not be easy for Zion Williamson, Luke Maye, De’Andre Hunter and the other top-seeded stars in the NCAA Tournament. The headlining teams are still around after avoiding upsets — some pretty serious scares, too. Hello, Duke! — during an opening weekend that went unusually to plan. Fourteen of the top 16, all of the No. 1, 2 and 3 seeds, reached the regional semifinals. The last time that happened: 2009. The Atlantic Coast, Southeastern and Big Ten conferences have gobbled up 12 of the 16 slots, with the ACC having a national-best five teams — led by top seeds Duke, Virginia and North Carolina — followed by the Southeastern Conference’s four and the Big Ten’s three. Duke faces No. 4 seed and fellow ACC member Virginia Tech (26-8), a rematch from one of Duke’s losses during the nearly six full games while Williamson, the star freshman, was out with a knee injury. Yet the Hokies — in the tournament’s second weekend for the second time in program history — will have point guard Justin Robinson, who missed 12 games with a foot injury and didn’t play in that win. Friday’s other semifinal will be No. 2 seed Michigan State (30-6) against No. 3 seed LSU (28-6) — which is still without suspended coach Will Wade amid a federal investigation into corruption within the sport. The fourth-seeded Seminoles (29-7) won last year’s meeting and own plenty of confidence after beating Virginia in the ACC Tournament semifinals. Thursday’s other semifinal in Anaheim, California, could be a rugged fight between No. 2 seed Michigan (30-6) and No. 3 seed Texas Tech (28-6). They’re the top two teams in KenPom’s adjusted defensive efficiency ratings, with the Red Raiders first (85.3 points allowed per 100 possessions) followed by the Wolverines (85.8). The Cavaliers spent the year playing amid the shadow of last year’s first-round loss to UMBC, the only 16-vs-1 upset in tournament history. And they were confronted with it again when they trailed No. 16 seed Gardner-Webb by 14 in the first half of Friday’s game. 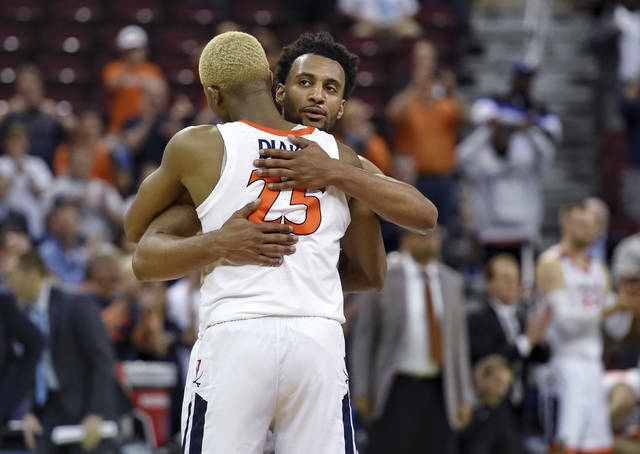 But Virginia found its steady, defensive-minded form after halftime then beat Oklahoma to return to the Sweet 16 for the first time since 2016. Thursday’s other semifinal in Louisville, Kentucky, has No. 2 seed Tennessee (31-5) meeting No. 3 seed Purdue (25-9) after eventful second-round games for both. Yet the biggest question surrounding Friday’s games in Kansas City hovers around No. 2 seed Kentucky and PJ Washington. The Wildcats’ leading scorer and rebounder missed the first two NCAA games while wearing a hard cast on his sprained left foot. The Wildcats (29-6) meet third-seeded Houston (33-3), which set a school record for wins against Ohio State on Sunday. 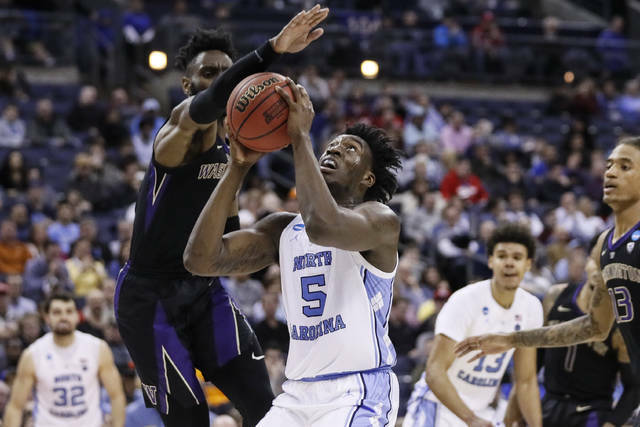 In the other semifinal, UNC looks to keep rolling when it meets the Tigers (28-9) — who peaked at No. 7 in the AP Top 25 in December, fell out of the poll then had a late-season surge to win the SEC Tournament and blow out Kansas on Saturday.